Take the stress out of Christmas Catering with this dead-easy 6-step barbecue whole turkey recipe. 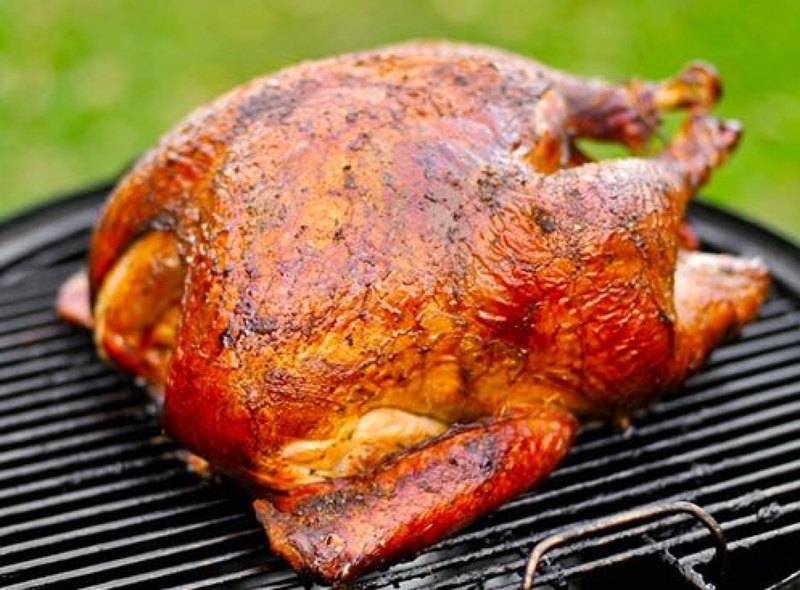 Barbecued turkey is succulent, full of flavour and has a beautifully golden, crispy skin. Say goodbye to oven roasted turkey forever! In 10 litres of water mixed with 800g of salt overnight. For an hour in fresh water, change the water every 15 minutes. This helps with retaining some moisture. We stuffed our Turkey with some lemon, rosemary & thyme but you can stuff it with whatever you fancy. It is vital to rub the outer skin down generously with butter though. Set up your Charcoal Kettle BBQ for Indirect Grilling (the bird sits on the grill with the coals underneath off to the sides). Fill a disposable aluminium tray with water which will double up as a drip pan and place this between the coals. The coals will be ready when they've developed a thin surface covering of white ash. You will probably need to add a bit more coals after an hour or two so keep a chimney starter filled with coals handy. Open your BBQ vents to about three quarters, this ensure air circulating and even cooking. Place it central, over the drip pan and directly on the grate, then close the lid. Allow 20 minutes cooking time for every pound of turkey. Remove from the bbq when its internal temperature reaches 65 degrees C at the thickest point. Allow the turkey to rest in its juices for up to an hour. And that's how you BBQ Turkey like a boss!